You must be one of the 3 highest national point riders attending from your state, in your rating category, to qualify. Each state can create up to 3 state teams. All highest national point riders attending from a state will be your state team A. All 2nd highest national point riders attending from a state will be your state team B. All 3rd highest national point riders attending from a state will be your state team C.
In the event that there is a tie that creates more than 3 positions in the top 3 of a division the tie-breaker rule is as follows: Number of shows competed in, if the tie remains the person that won the most points at any individual show will be chosen. It is necessary to have attended five sanctioned shows to ride in the “STATE EXTRAVAGANZA”. The highest point Beginner, Rookie, Novice, Amateur, Open and Masters from each state nationally will each ride twice with their five other state team members on their state team A. The 2nd highest point Beginner, Rookie, Novice, Amateur, Open and Masters from each state nationally will each ride twice with their five other state team members on their state team B. The 3rd highest point Beginner, Rookie, Novice, Amateur, Open and Masters from each state nationally will each ride twice with their five other state team members on their state team C.
If you are tied in the same position (ex. 1st place in both categories) then you will ride in the category that you earned the most points in. In the other category, you will trade positions with the next person under you. Example; you are in 1st place in the Novice class with 89 points and 1st place in the Masters class with 50 points. You will ride on the 1st team, Team A, as a Novice. You will ride on the 2nd team, Team B, as a Masters. The second-place person in the Masters class will ride with the 1st place team, Team A. Those 2 contestants will swap places. If you placed in the 3rd place position in 2 categories then you will trade places with the 2nd place person in the category that you earned the least amount of points in. Each state team of 6 will pick 3 teams from their 6 members for their first ride. They will also draw a partner from their 6 for their 2nd ride. 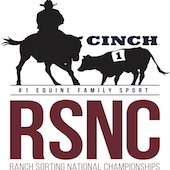 The draw will be done by Cinch RSNC in the following manner: A team will be assigned to every scenario that the 6 rating categories can make. On Wednesday night 2 rating categories will be drawn out of a hat and that combination will be used for all state Extravaganza draw teams. The Division will be an All Level Handicap. If a high point member does not attend, the next highest point member who attends can ride. If no member qualifies or attends in a rating category, then the highest attending member in the next rating category down is eligible. If a Masters does not qualify or attend, any youth attending from that state can substitute. If a State doesn’t have enough attending members for a six-person team then they can combine with other states in the same situation. However, the rating categories must be enforced for the assembled team. Only the top 20 qualifiers are eligible to combine with these other states and only if that state is not complete enough for 3 teams. One of six Saddles will be awarded to each member of the winning team! Awards will also be given to the 2nd and 3rd place state team. The state team of 6 riders with the most cattle sorted and the fastest overall time in the State Extravaganza All Levels Handicap Class will advance the top three states to the finals. The team members of the top three states will all ride again with the same partners as before with a clean slate (three states equaling 18 teams to the finals). Your first objective is to win 1st in your state. No state can win 2 sets of 6 prizes. Tie breakers: Total # of cattle sorted is 1st and time on ties is second (for states in Top Ten). The state team of 6 members with the most cattle sorted in the fastest combined time will win!